One of my neighbors works as a finance man for exotic car dealerships. That position allows him to bring home some special cars. Recently his driveway was graced with an Audi R8. As I was curious, last Friday evening I checked out the website for the last place where I knew he worked. Turns out he no longer works for this dealership. No R8 there but, as the dealership listed their cars alphabetically, the three Aston's were first up. 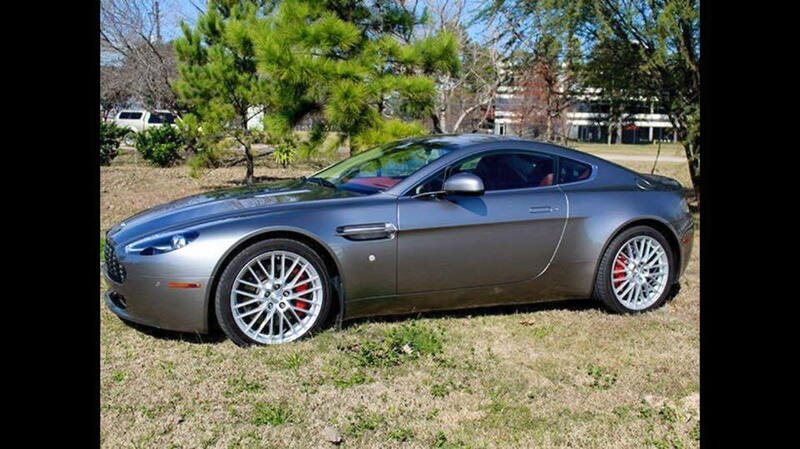 When I saw the 2007 V8 Vantage, my first thought was that it was so beautiful. I looked at the price and thought this might be doable. And I had a hard time sleeping that night. Early the next morning I drove for an hour in my '07 Porsche 997 to see the car. One of the owners had been driving it and it was dirty but oh that sound of that motor!!! After some heavy negotiating, the Porsche stayed there and I drove the Vantage home. And I love it. I have been a Porsche club member since 1978 and have had many Porsche's, and other nice cars, over the years. My 997 was a great car but this car is in a different league. Besides the motor, I love the interior. All of that leather and real metal on the AC vents, the *****, the door panels, the angled struts on the interior and in the engine bay, and the aluminum eyelet for feeding the seatbelt. Even the inside of the glove box is leather!! After 48 years of marriage, my wife is seldom surprised when I show up with a different car. As I opened the garage door, her response was, "That's our car?? Kind of says it all!! Beautiful car! I sold my 997 some time ago as well. When I came back to the sports car world, I ended up getting something similar to yours: manual 2007 V8 Vantage. Still amazed by it everyday. Congrats and enjoy in good health! Outstanding! Congratulations, that is a beautiful car. My 2010 V8V in Mercury Silver with Chancellor Red interior puts a smile on my face every time I drive it. Every...single...time. Never have loved to get behind of the wheel of a car as much...Enjoy the sound. Enjoy the drive. Welcome to the AM club. One advantage of living near Charlotte, NC is I can drive the car nearly all year. Probably will drive it today!! Welcome to the world of Astons. Porsche makes wonderful cars but nothing puts a smile on my face like my Aston Martin does every time I drive it. When I take my wife out on a nice date she always asks if we can take the Aston. Your car is beautiful, enjoy! Welcome, beautiful car and great choice! Very nice looking Aston. Welcome to the Aston world,lots of information and help on this forum. Enjoy your new toy. That car looks super clean, welcome! More snow? Here in sunny Minneapolis I actually took mine out of storage today! Used the storage start procedure holding pedal to floor... Would not go out of 1st gear (like a moron I forgot to also hold brake pedal). Imagine a February timing for outing! Love that global warming.